We already knew that Titan experienced methane rainstorms on its south pole, making it the only astronomical object we know of where it rains onto the surface. The moon tilts on its axis, but as its position changed and as clouds refused to form over its north pole, scientists wondered if and when they’d see evidence of changing seasons. Cassini’s observations of the long-overdue rain finally came in on June 7, 2016, signaling the start of Titan’s north polar summer. Today, scientists report the results from an analysis of data coming from a spectrometer on Cassini: a distinct bright spot covering an area the size of Pennsylvania, or 120,000 square kilometers, but only on certain days. The researchers hypothesized that they’d spotted liquid filling in the cracks on the moon’s surface, causing it to reflect more sunlight. In other words, they saw a broad damp region on the surface, like a big swath of wet pavement—the result of rain. It’s important to note that there are other hypotheses as to what may have caused the bright spot, such as fog, according to the paper published in Geophysical Research Letters. 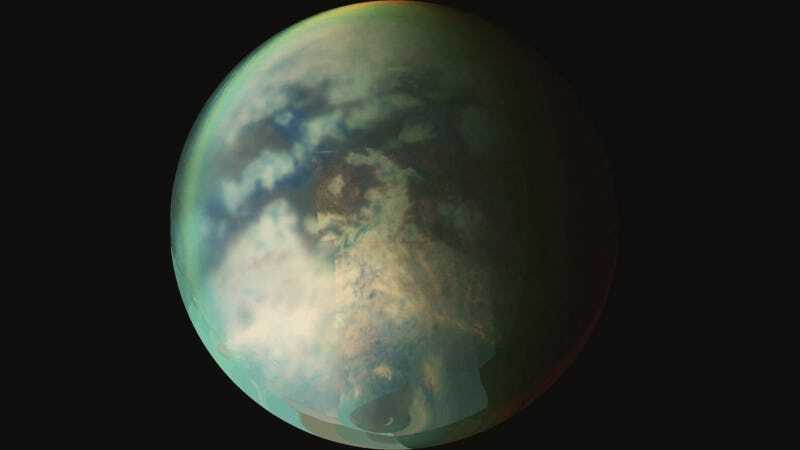 The researchers felt, based on their analysis, that surface wetting from presumed rain was the most likely explanation, though, which would make this the first observation of rain on Titan’s north pole. This the “wet sidewalk effect” could now serve as a new way to observe this rain.